There are a few major battles waiting for you in this otherwise unremarkable stage, so try to keep your energy up as you proceed. The toughest struggle is at the very end, of course. From where you first appear, head right along the girders. There are flying enemies here that you can easily blast out of the sky, potentially for helpful rewards. Be mindful of their presence whenever you try to leap across any of the moderately wide gaps you encounter along the way. There's no need to hurry. As you reach the far side of the area, you'll find an alcove with spikes lining a slanted roof above it. Ahead, you'll see special weapon refills. The floor just ahead of them is false, though, and you'll fall through it when you set foot on what appears to be solid ground. 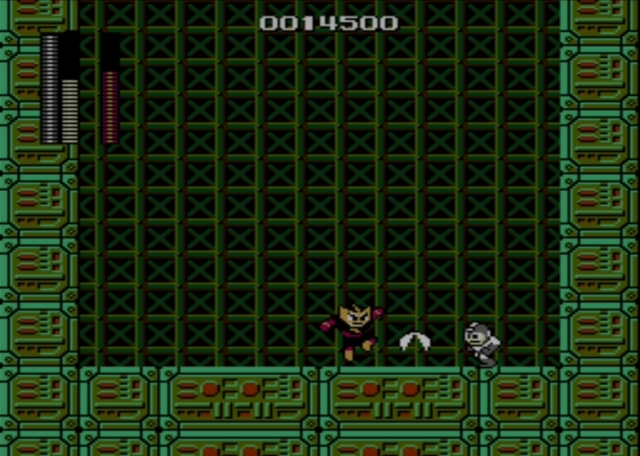 That causes you to drop into a chamber where you must battle a familiar enemy. 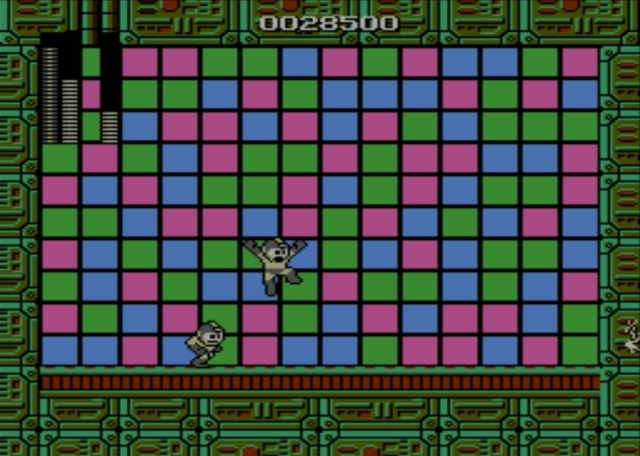 Defeat Cut Man in battle, using whatever technique suits you. 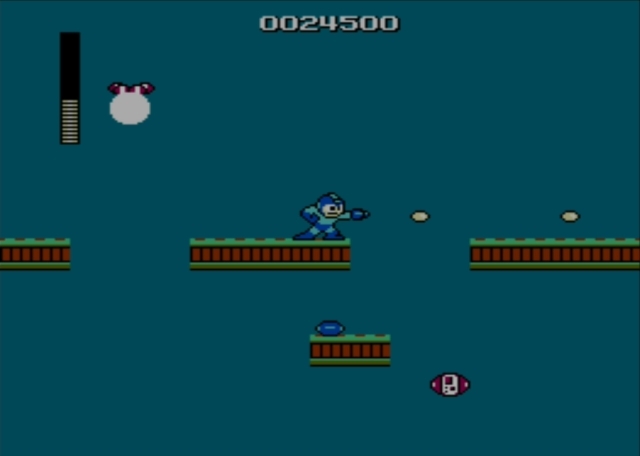 He's even easier here than he was when you first met him, so dealing with him using just your arm cannon and some smart jumping skills should work, if all else fails. 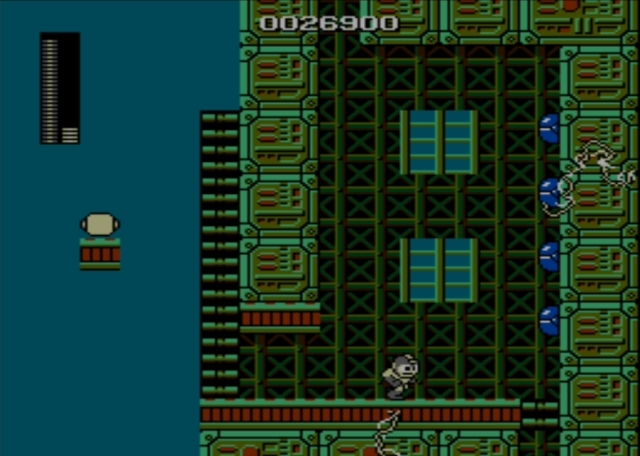 Once you defeat the robot master, drop through the false floor to the left to land on more girders like those that greeted you at the start of the stage. 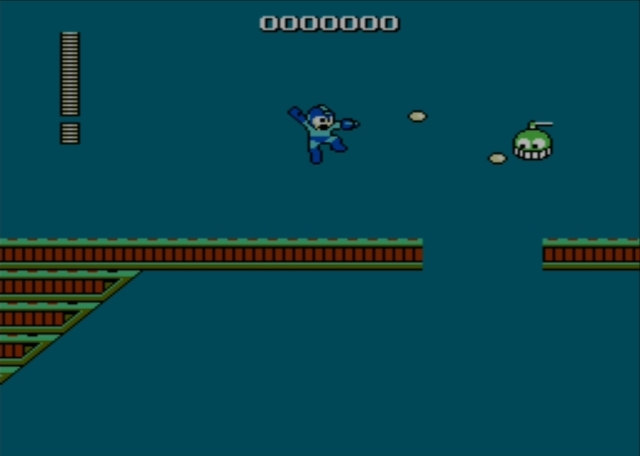 Continue to the right, this time battling some of the enemies that resemble sprinklers. Their spread shots can catch the impatient gamer and knock him into the abyss, so don't let yourself suffer that fate. At the far right side of the area, there's another of the alcoves with spikes ascending along a slanted roof. 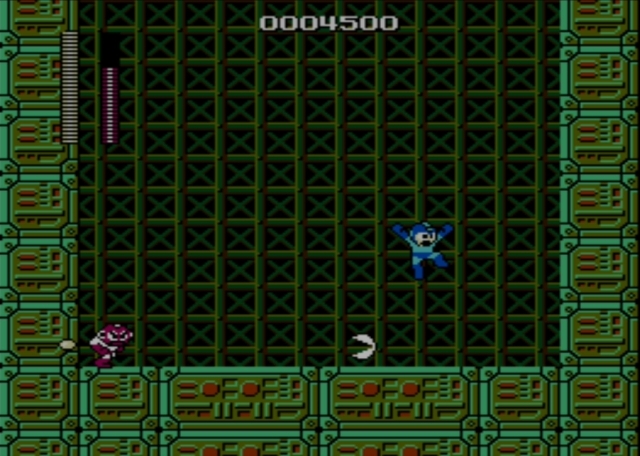 Which means another false floor and another boss battle. This time, your adversary is Electric Man, who doesn't like cut blades any more this second time around than he did the first. Hit him with a few shots from that weapon to quickly end the fight. Then drop through the false floor to the left. As you proceed to the right yet again, you'll find a lot more pits. These are guarded by enemies that launch skyward as you approach. They explode as shrapnel, so you'll need to be careful as you traverse the treacherous area. As usual in this stage, a slow and methodical approach works best. On the far right side of the area, you'll find a ladder to descend. 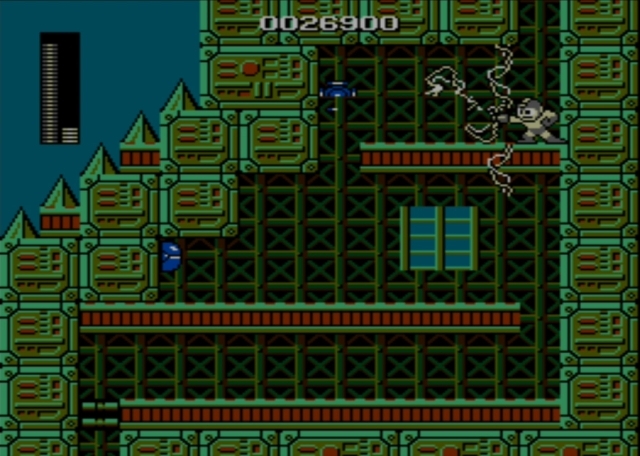 Here, sponge-covered enemies guard a vertical shaft. Give them time to move, so you know how you need to counter those movements in order to avoid taking damage, especially since you may be a bit worn out from your dance with Electric Man a moment ago. Descend through a few more rooms of a similar nature and finally you'll reach a new chamber with four shielded wall cannons to your right. You're used to dealing with these by now, though the safest method is simply to take out the bottom one or two and then run below the others. Any other approach puts you at risk of taking extra damage. There's the start of a ladder on the right side of that room. 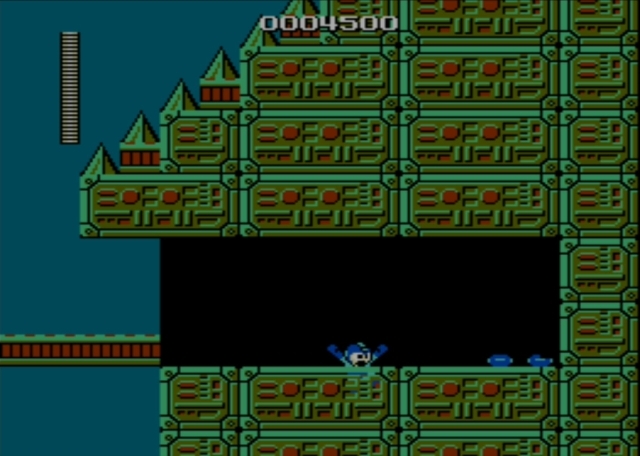 Drop down from it and pass through the opening into the next screen, where you'll soon be rushed by more of the sponge-covered enemies. The arm cannon doesn't seem to be enough to reliably stop that charge, so you're better off using a quick electrical blast. It does the job quite nicely. 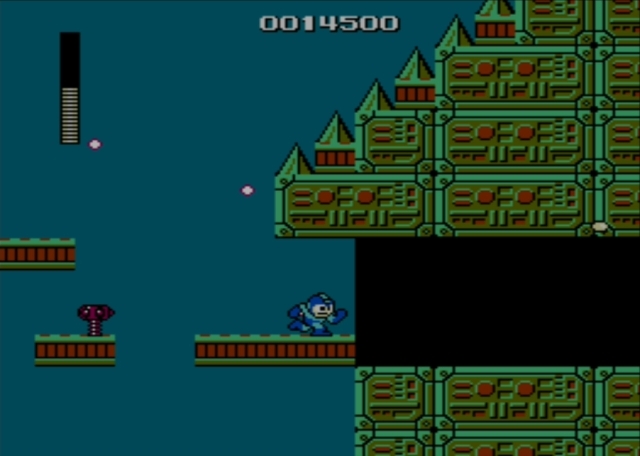 Then you can drop through to the next screen to finally reach the area's true boss battle. Your foe here is a not-particularly-creative copy of yourself. After the pods lower and do their duplication magic, there is a slight pause and then it's time to duke it out with yourself. The trick to this fight is that, once again, you are at a severe disadvantage. Whatever special weapon you equip, your foe will do the same. He has all your abilities, plus one other benefit: every shot of his that hits you does significantly more damage. The room is flat, so you can't exactly jump around and stay out of the range of shots. You aren't capable of doing much damage with anything, but you can use "the pause trick" yet again. It's no less useful here than it was against the boss in the previous stage. This time, instead of using the cutter, switch to the electric beam and let it slowly work its way through your rival. A few shots should be more than enough to do the job.